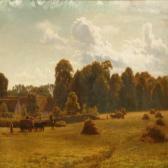 Find artworks, auction results, sale prices and pictures of Gotfred Rump at auctions worldwide. 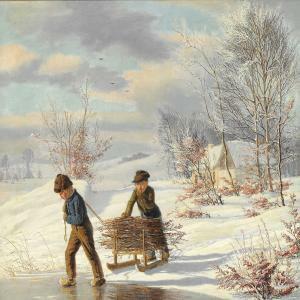 Godtfred Rump: Winter landscape. Inscribed on the Back Rump 38. Oil on canvas. 64,5 x 79 cm. 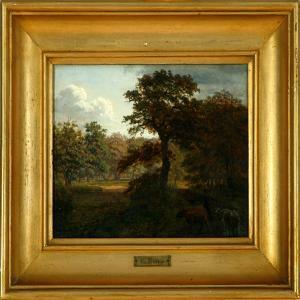 Exhibited: Charlottenborg 1838 no. 313. Provenance: Old label with the following information (in Danish): "Bought in .... 1864 at the auction after F VII (?)). Prince Christian (Chr . VIII). Chamberlain Treschow, Brahesborg. "Parti af Rye Sönderskov med udsigt til Mossöe og Gudensöe". 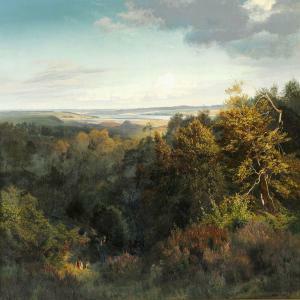 View from the southern Rye forest with the lakes Mossø and Gudensø. Signed and dated Godtfred Rump 1852. Signed and dated on the stretcher Gotfred Rump1863. According to a tradition in seller's family this presentpainting should be an allegory of autumn - one work of GodtfredRump's original four allegories of the four seasons atBregentved. 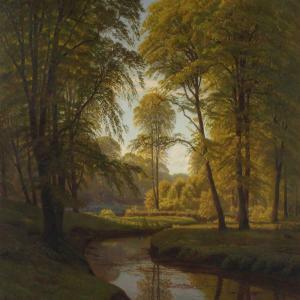 Godtfred Rump: Forrest scenerywith small stream. Forrest scenery with small stream. Godtfred Rump: Late afternoon in an autumn forest. Usigned. Inscribed on the stretcher Godtfred Rump. Oil on mahogany. 15 x 20 cm. Late afternoon in an autumn forest. Usigned. Inscribed on the stretcher Godtfred Rump. Oil on mahogany. 15 x 20 cm. The collection of Reinhard van Hauen Master baker.